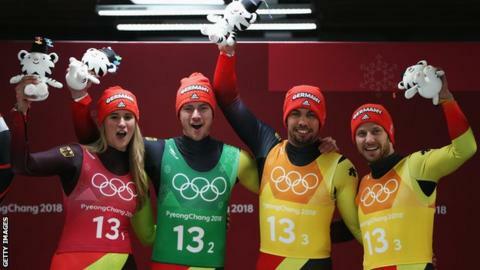 Germany claimed a third Winter Olympics luge gold medal in Pyeongchang by defending their relay title. Women's singles champion Natalie Geisenberger laid the foundations before men's singles bronze medallist Johannes Ludwig maintained their lead. Doubles champions Tobias Wendl and Tobias Arlt eventually extended the advantage to 0.355 seconds over silver medallists Canada. Austria claimed the bronze medal, 0.471 seconds adrift of Germany. It was Germany's ninth gold medal in Pyeongchang, stretching their lead at the top of the medals table. Norway are second with six. It handed Geisenberger a fourth Olympic gold - she also won the singles title and relay event four years ago in Sochi. Wendl and Arlt also have four each. It was Ludwig's first Olympic gold, having been picked for the relay ahead of Felix Loch, who was part of the team in Sochi.